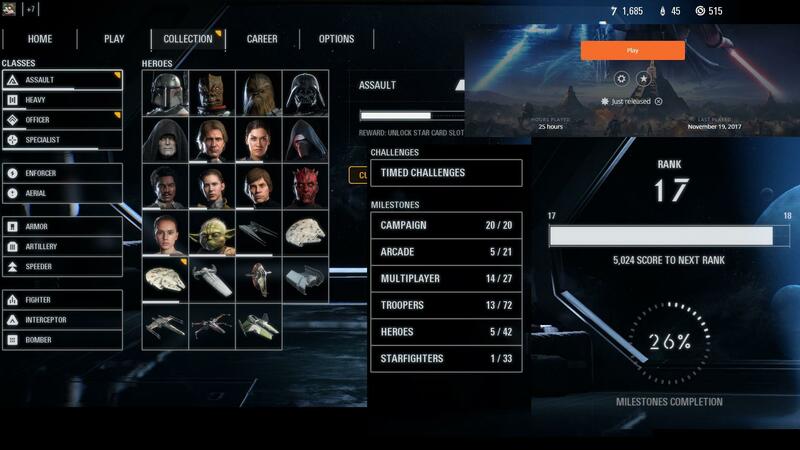 In the last blog about the Battlefront 2 controversy, we mentioned we heavily expected EA to change something about the ridiculously long playtime of 4,528 hours to unlock all base-game content, as calculated by Soeren Kamper of fan site SWTOR Strategies. Well, EA has made some changes. According to a Reddit post, EA has tweaked the costs of the Heroes so much, that it would now only take around 24 hours to unlock all, however everything else remains untouched. As can be seen in the picture below, the player has unlocked all base-game Heroes in 25 hours of gameplay. According to players, if you spend all earned credits on unlocking Heroes, plus the starter bonus credits, you would be able to unlock them relatively quickly. However, the actual reward rate remains untouched, leading to progression bottlenecks. This is because EA has so far only lowered the price of Heroes and temporarily removed microtransactions, leaving the cost of normal units and star cards unadjusted. And due to the fact that the game gives out credits based on match time and not performance, several hours of grinding are still needed before being able to upgrade any non-hero character or ability. What are your thoughts on this? Are you happy to see EA is making changes? Let us know!